Can a design patent claim multiple three-dimensional embodiments based on a two-dimensional illustration? The U.S. Court of Appeals for the Federal Circuit (Federal Circuit) has reversed the Patent Trial and Appeal Board (PTAB), creating a new test for the indefiniteness of claimed ornamental features based on limited, two-dimensional illustrations. In re: Maatita, No. 2017-2037 (Fed. Cir. August 20, 2018). The applicant, Ron Maatita, filed U.S. Design Patent Application No. 29/404,677 (unpublished) claiming a series of features on an athletic shoe bottom. The rest of the shoe bottom was disclaimed. The applicant included two two-dimensional drawings of the shoe bottom which differed only in the unclaimed environment surrounding the claimed features. During prosecution, the examiner ultimately rejected the application under 35 U.S.C. § 112 as being indefinite since the two-dimensional plan views left the design open to multiple interpretations regarding depth and contour of the claimed features. Specifically, the applicant disclosed only two-dimensional views for features which were three-dimensional in nature. In a final rejection, the examiner included four different possible three-dimensional embodiments of the claimed features. Because these embodiments were patentably distinct, the examiner argued that they could not be covered by a single claim. The examiner's position was affirmed by the Patent Trial Board of Appeals (PTAB) on March 29, 2017. On August 20, 2018, the Court of Appeals for the Federal Circuit unanimously reversed the PTAB. The Federal Circuit explained that, "[t]he purpose of § 112's definiteness requirement … is to ensure that the disclosure is clear enough to give potential competitors (who are skilled in the art) notice of what design is claimed – and therefore what would infringe." Maatita, slip op. at 9. The Federal Circuit then linked the standard for indefiniteness to the standard for infringement, adapting a test created by Egyptian Goddess, Inc. v. Swisa, Inc. 543 F.3d 665, 672 (Fed. Cir. 2008) (en banc). In assessing the indefiniteness of a design application of uncertain scope, the Federal Circuit stated that, "a design patent is indefinite under § 112 if one skilled in the art, viewing the design as would an ordinary observer, would not understand the scope of the design with reasonable certainty based on the claim and visual disclosure." Maatita, slip op. at 10. "So long as the scope of the invention is clear with reasonable certainty to an ordinary observer, a design patent can disclose multiple embodiments within its single claim and can use multiple drawings to do so." Id. Rejecting the PTAB's argument that the claimed design was indefinite because the two-dimensional plan views could be applied to the three-dimensional features in a number of different ways, the Federal Circuit stated that, "the level of detail required should be a function of whether the claimed design for the article is capable of being defined by a two-dimensional, plan- or planar-view illustration." Id. at 12. 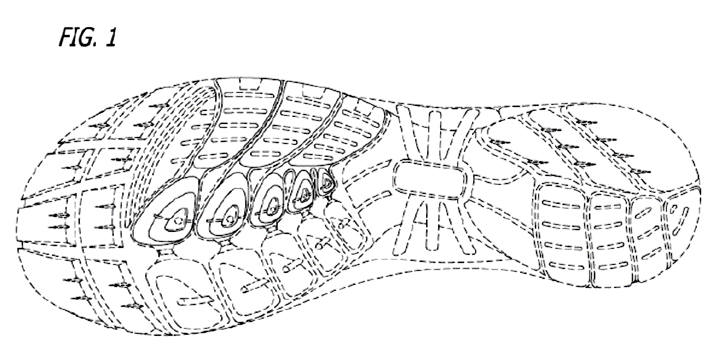 "The design for an entire shoe … is inherently three dimensional and could not be adequately disclosed with a single, plan-, or planar-view drawing." Id. Comparatively, "[t]he design of a rug … is capable of being viewed and understood in two dimensions through a plan- or planar-view illustration." Id. "Such a claim, with a single drawing, would cover all similarly designed rugs or mats." Id. The Federal Circuit was not persuaded by the PTAB’s argument that the varying surface depths of a shoe bottom impact the visual impression of the claimed features. 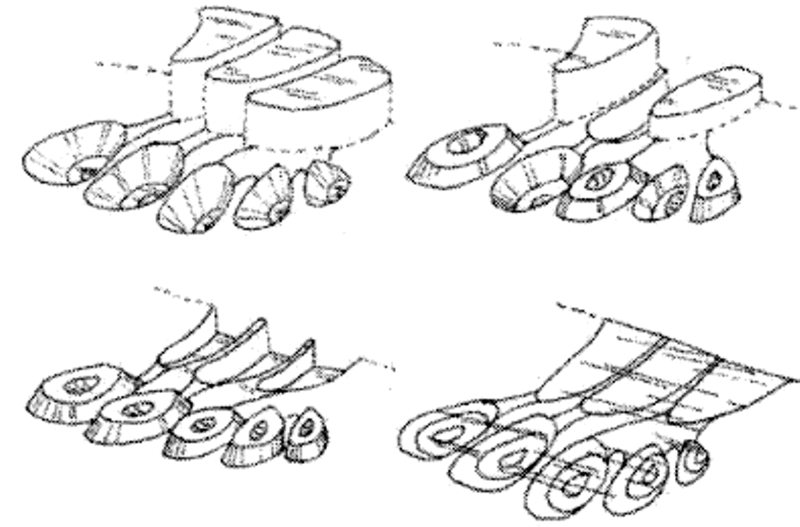 "[T]he fact that shoe bottoms can have three-dimensional aspects does not change the fact that their ornamental design is capable of being disclosed and judged from a two-dimensional, plan- or planar-view perspective – and that [applicant’s] two-dimensional drawing clearly demonstrates the perspective from which the shoe bottom should be viewed." Id. at 13. Rather, the “decision not to disclose all possible depth choices would not preclude an ordinary observer from understanding the claimed design, since the design is capable from being understood” from the two-dimensional perspective in the drawing. Id. The Federal Circuit's decision may have a significant impact on the filing strategy for design patent applications. Typically, design patent applications include several figures showing the claimed ornamental features from a variety of plan and orthogonal views. For large, three-dimensional designs, this filing strategy will likely remain the same. However, for ornamental features adorning only a single surface of a product, this ruling may provide an incentive to provide fewer drawings from fewer perspectives to capture as much scope as possible. This ruling may also create some concern for commercial entities trying to avoid infringement. Broader design patent claims create a higher risk of infringing a claimed design. When assessing design patents similar to Maatita's, designers and manufacturers will have to carefully examine a product from the limited perspectives shown in the design patent to determine their risk for infringement. A three-dimensional component to a design may not be sufficient to avoid infringement of a claimed design disclosed only from a two-dimensional perspective. It is not yet clear if this case will be reheard en banc or if the U.S. Patent and Trademark Office will file a petition for certiorari. Disputes involving design patents rarely reach the Supreme Court. However, the significance of this decision may be significant enough to warrant further review.